Until Queen Victoria popularised the white wedding gown in the 19th Century there was no set colour that brides were expected to wed in. 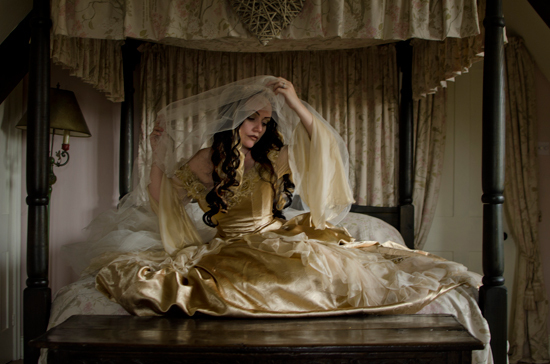 In fact brides from wealthy families were often found in bold colours and rich fabrics. The language of colours has changed over the years, for example black was a common colour for Scandinavian brides while white was the French colour of mourning. So too have the fashions, and the wedding attire has moved along with it. 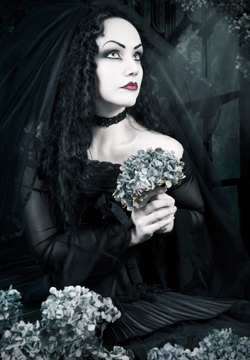 However Goths have always danced to their own tune where popular trends are concerned, and no more so is this evident in how they choose to tailor one of the most important days of their lives. Steff Metal, a Gothic Wedding Planner from New Zealand aptly describes it thus: “I think there are two key elements to a Gothic wedding – attitude and aesthetic. 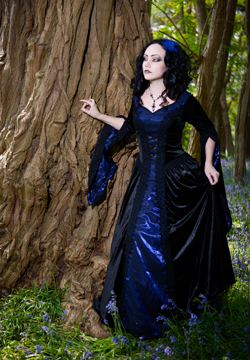 The Gothic aesthetic has a few distinct features – it’s elegant, it’s dark – with a palette of black, red, purple, blue, or even dark green, it has an element of theatrics about it, and it has a bit of twisted humour. It doesn’t take itself too seriously, and doesn’t see anything wrong with having skulls as centrepieces at a wedding ceremony or a cake topper with two skeletons hugging. 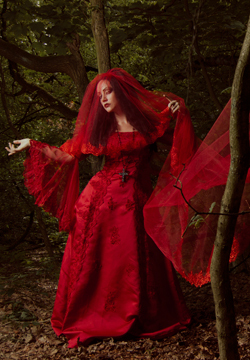 Whatever the choice, the great thing is that for a Goth, their wedding attire can be weaved into their wardrobe long after the day is done, rather than languishing in a dust cover never again to feel the beauty of movement. And strangely it is only a fairly modern construct that has made the wedding dress a one day deal. The wedding gown would often become the newly married woman’s “Sunday best” or would adapted and retrimed for evening wear for another season. Even Queen Victoria removed the lace overskirt from her dress and frequently used it again – she wore it over a black silk gown for her Diamond Jubilee celebrations over 50 years later. 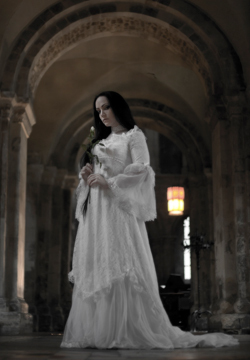 Indeed I’m quite sure it is their attention to detail, luxurious fabrics and quintessentially gothic styling that make them a de facto choice for a Gothic wedding. Their prices are also quite reasonable, while definitely in the ‘special purchase’ bracket, they are not out of range for most people. eBay too is a fabulous tool for the bride on a budget (and truth be told aren’t we all?). I confess to own a number of wedding dresses, the majority of which came from that wonderful site. Many of the suppliers on there will make your dress in any colour, so even if the cover image isn’t quite to your liking but the style is, do have a click through and look at their colour chart. Great search terms are “long sleeves” and “ball gown” when combined with “wedding dress”. Do be aware that some of the detailing may be less than perfect in these dresses, but they make a great base for customisations so you can truly add that personal touch! 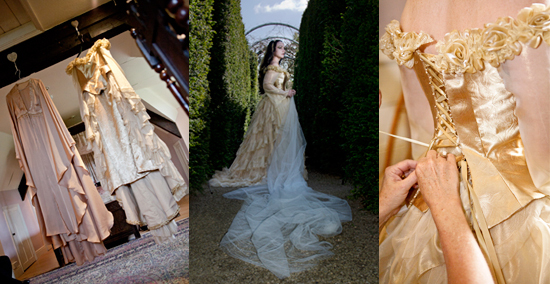 And here’s some never before seen images of the wedding dress that I got married in last year!